Please leave us your name/names below. Maximum of 12 letters per name. 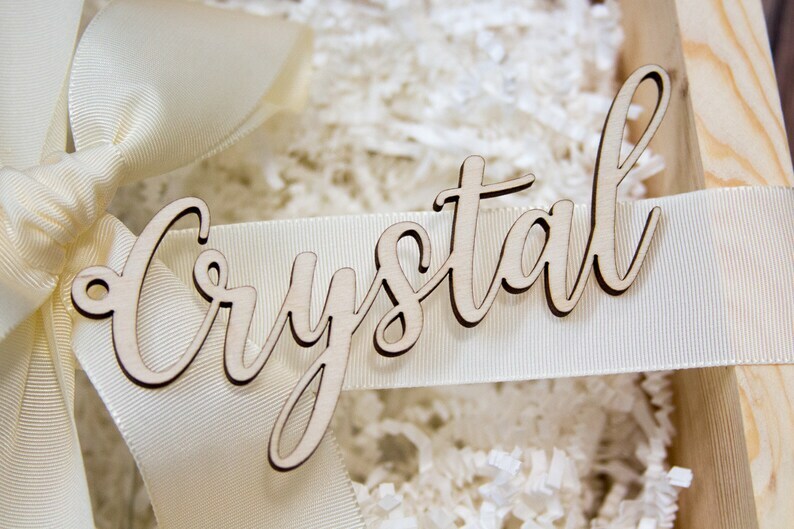 These beautiful bridesmaid name tags will surely make your closest friends feel super special! There is just something about seeing your name in print that grabs at you and makes you want to keep it forever. These name tags make a wonderful memento of such a special time and are sure to bring back that special feeling over and over again. • Maximum height is 2.75 inches with uppercase and lowercase letters. For example, "Crystal" has a max height of 2.5 inches while "Marianne" is about 1.5 inch tall due to the letters of the name but they are all cut at the same font size. • Listing is for STANDARD DESIGN as pictured. If you'd like a CUSTOM DESIGN or anything at all just convo us or send us an email! They are beautiful! They came very fast and were properly packaged so nothing was broken! I was very pleased and will be purchasing again in the future! Thank you!